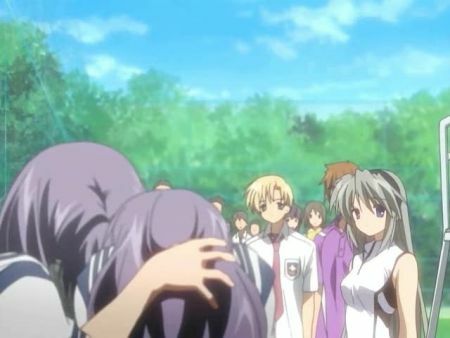 Otakuism » Thoughts on Clannad - 18, or Wait, That’s It? Thoughts on Clannad - 18, or Wait, That’s It? After the multi-arc “epics” of Fuuko and Kotomi, Keyani chooses to blow through Kyou/Ryou’s and Tomoyo’s arcs in one episode. I’m left with the feeling of “what the hell did I just watch here?” First there’s the tragic cutting of Tomoyo’s story, which is tragic mainly because Tomoyo is one awesome character who can make any scene she’s in better. And her back story actually makes plausible sense! It’s still the same kind of trite Key melodrama, but I feel like if her brother’s story got proper development it really could of been something, instead of the actual, you know, five minutes we got on him. The whole way Tomoyo’s back story was handled was atrocious. Tomoyo was just like “oh, I haven’t told you my tragic emotional back story that drives me. Silly me.” It was all so artificial and “tragedy” for tragedies sake. At least her bowing out of the race for Tomoya’s heart was handled with some grace, the kind of silent recognition that lets her move on. What an amazing contrast that is to the Fujibayashi sisters, who really let the waterworks loose this episode. Ever since the end of the Kotomi arc Kyou and Ryou have been there in the background, Kyou working her magic to get Tomoya with Ryou. The whole time I was thinking “this is nice, but it will be better when the main story focuses on them.” Then this episode comes along and all of a sudden both girls are out. What the hell was their purpose? Why did Ryou like Tomoya, why did Kyou feel like she needed to play matchmaker, and why did she like Tomoya? Keyani decides to wash away all those little inconsistencies in the most cliche manner possible: a lot of crying. I have no idea what the importance of these girls was suppose to be, and it looks like the story doesn’t care either as it moves on with Nagisa. Fine with me; let’s just hope her story actually remains coherent. Wake up, that’s not the kind of show Clannad is. I wonder why you’re even watching this sometimes. Just for the sake of blogging something popular so you get more hits? Seriously. I’m not saying I need all the stories to line up neat and nice. I’m just asking for the damn things to be coherent. If you’re not going to spend some time actually developing characters then don’t include them at all! ahetg: not to sound counter-striking, but your comment is kind of harsh. You make it sound bad as if it’s bad to post opinions like this. And if you need to critique a persons opinion, it;s much better to post it in nicer fashion. And the latter part of your comment is way off. People blog because they freaking blog. Perhaps it’s a bonus to have people comment, but seriously. Posting annoyances is damn fun . And to REALLY comment. Though as I wasn’t annoyed by the episode. I do see that the evidence of things being rushed can be seen. Tomoyo’s philosphical discussion (despite being really nice) did seem alittle out of place. And now there’s nothing to worry about because she’s part of the student council. Thanks for the kind comments Avisch. Despite all the bad pacing issues Clannad seems to have, I still enjoy its characters, especially Tomoyo. It’s a legitmately fun show, it’s just not winning any plot medals for me. Same here. 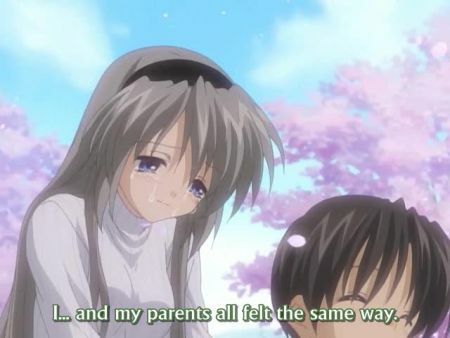 Tomoyo hapepens to be my favorite character of Clannad, but I enjoy the show for the other characters aswell. I’m not Kyoani fanboy but I give them lots of credit for making good adaptions of Key works. But for me they have not made a hugely loveable anime that will stick in my mind if someone asks “what was your favorite anime for a period of time”. ahetg: this might be a bit slow, but that’s exactly what Clannad is, a VN with an arc based on on the heroines. Naturally, why shouldn’t the anime adaptation be, Kanon did, didn’t it? Even if that fact is ignored, the fact that kyoani spent some 14 episodes on two arcs, and suddenly bomb dropped another 2 arcs in less than half that amount is ridiculous. I’d much rather they make this a 36 episode series than cut up the show’s potential like that. I personally disliked episode 18. I’d thought they’ll make Clannad much sadder, similar to other key VNs they adapted, but alas, kyoani has only been doing comedy lately, it seems, that might be taking a toil on them. Well, the series is only 24 eps long (way, way too short), so somethings had to be cut to make way for our cliched Nagi-tan X Tomoya epic. The sisters, and Tomoyo got the short end of the stick here. CLANNAD would’ve been FAR better suited as a two season 52 episode series. Well, there really isnt much else they COULD do.